This little hostel is located really central to everything, but not too central to be in the middle of the crowds. The staff is super nice and would help you get any tips for your trip! It is really clean and it has a super nice terrace to see the city. The hostel also has a great breakfast! Totally recommended. It was definitely one of the best hostels we ever stayed. It is a small lovely hostel with a typical moroccan style and really close to the mainsquare Jemaa el Fna. But the best are definitely the friendly and really helpful staff there. We always got tea for free and we felt like in our own family. Ismael and Salah were always smiling and friendly. Especially Salah told us a lot about his life in the Sahara and he gave us a lot of helpful tips for Marrakech like normal prices for spices. Meine Begleitungen und ich waren im Frühjahr zu Gast im Raid layla rouge. Wir waren rundum zufrieden. Das Personal war überaus freundlich und zuvorkommend. Wir wurden direkt bei der Ankunft mit frischem Tee begrüßt und über die weiteren Tage ständig mit Tee versorgt. Das Gruppenzimmer sowie auch die Einzelzimmer sind sehr ordentlich und authentisch eingerichtet. Das Hostel ist in einer ausgezeichneten Lage. Nicht zu weit vom Kern der Medina aber auch nicht im Zentrum des geschehens. Ruhiges und sehr schönes hostel in zentraler Lage mit einem wunderschönen Ausblick über die Stadt. I had a very pleasant stay at Riad Layla Rouge. The hostel is clean, the beds are comfortable and the breakfast, which is included, is delicious. The location of the hostel is also great in the city center. The hostel has two rooftop terraces which are great for chill out and meeting other travellers. The host, Ismael, does everything to make your stay as enjoyable as possible. Thank you very much for that Ismael! :-) I would definitely recommend staying there. My gf & i spent 2 nights at riad layla rouge in the shared 8x bed room. 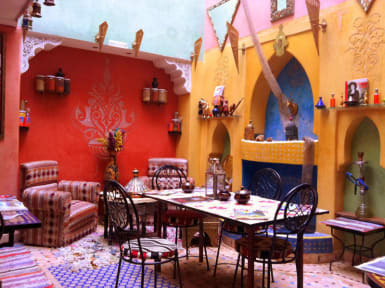 On our trip to Morocco we stayed at 4 different riads, but the best was at layla rouge. For under 10euros/night we had a peaceful refuge to counterbalance the demands that marrakech streets & souks pose. Ismael took care of us & saved us time and money. By merit, authentic marroccan hospitality & kindness that we enjoyed here. For that we are thankful! Nice hostel located in the middle of the old town. Wonderful roof top. The room was amazing the only thing missing was a lock for our room, we had to use our own one.